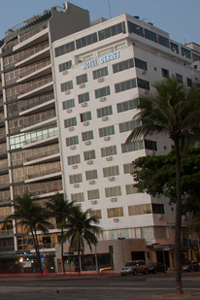 The Excelsior Copacabana Hotel is located in the very best area of Copacabana, enjoys a oceanfront view, and is one of the most elegant hotels in Rio de Janeiro. Elegance and comfort are found in each of the hotel's 233 rooms and suites. Rooms are equipped with central air conditioning, individually controlled, direct dialing through two digital telephone lines, cable TV, radio, minibar, electronic safe, voice mail, data port. granite bathrooms with telephone, hair dryer, magnifying mirror and a complete line of bath amenities for the comfort you deserve. The Hotel features a restaurant, 2 bars, swimming pool, health club, and meeting rooms. When would you like to stay at Windsor Excelsior Hotel ? 1) Rates at the Windsor Excelsior Hotel may not be valid during Carnival, New Years, Easter and other special dates.